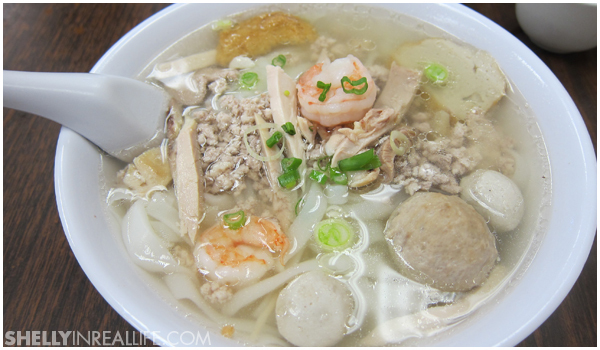 In Oakland Chinatown, Vien Huong serves the ultimate comfort food for me. There is nothing like a bowl of Chow Jew Ho Fun from Vien Huong after a long Saturday night out, or any other time actually! The broth tastes relatively MSG-free, unlike most pho broths, so that alone is killer for me. Ho Fun (or Rice Noodle, however you want to call it), topped with shredded chicken , grounded pork, beef balls, fish balls, fishcake, scallions, and bits of fried garlic/shallots, it really hits the spot. Of course, I have to have my hoisin sauce and their "homemade" hot sauce on the side. Their hot sauce really gives me another reason to come here, seriously. I don't put my sauce in the soup because as I mentioned, their broth is too pure for me to pollute with sauce. Come here, bring cash, order Chow Jew Ho Fun, and maybe a cold Horlick or Ovaltine, you won't regret it. Trust.